Best hotel for shopping and sightseeing in Myeongdong! Hotel Skypark MyeongdongⅠopened this summer. Hotel Skypark MyeongdongⅠ’s main target is foreign tourists, and the hotel is receiving good reputation from guests for its convenient location and affordable room rates. The hotel consists of top 3 floors of 11-story building. 8F-10F are guest rooms, 11F is front desk, garden and lobby. Room types are Double, Twin, Deluxe Twin. Up to 3 guests can stay at Deluxe Twin rooms in order to accommodate various tourists from single to group travelers. There are must-see shops in the same building. 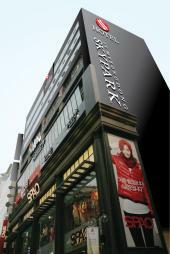 For example, restaurant serving delicious Korean meal in 6F, everysing operated by Sm Entertainment in 4F and Korean Uniqlo ‘SPAO’ in 1-3F. There are many cosmetic shops and food stands in the surrounding area, and even more, shopping mall Migliore is 2min walk away and Lotte Department Store and duty free shop is 5min walk away. The location of the hotel is perfect for sightseeing as subway line 2 & 4, city bus stop to major tourist sites are nearby. Enjoy your stay at Hotel Skypark MyeongdongⅠ.